Since its creation, NOVETUD Group has been developing its activity around the design, manufacturing and sales of thermoformed plastic parts. 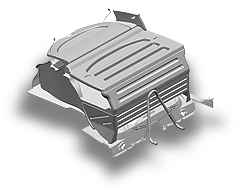 These thermoformed parts, used as interior or exterior trimmings, are characterised by their quality aspect, dimensional precision, recyclability and depending on the case, their large size.They exist as elementary parts or fitted subassemblies. Its work organisation with skilled teams and performing production means. Its customers are international companies requiring high quality products and services at competitive prices. VOLKSWAGEN France Group to introduce the transforming kits* POLO and GOLF in the magazine KM Entreprises. (*) from a personal vehicle to a commercial one. The certification ISO 9001 has been reneured for 3 years for all the companies of NOVETUD Group. 2009 : The certification ISO/TS 16949 has been reneured for all the companies of NOVETUD Group and assigned to FACAM DISTRIBUTION for the first time. NOVETUD OTOMOTIV has been assigned the ISO 14001 certification for the first time. 2010 : All of the companies of NOVETUD Group obtained the environmental certification ISO 14001. 2011 : On the 29th of March 2011, NOVETUD Group received from PSA General Management the Trophée PSA 2011 rewarding its 100% service rate for the year 2010. 2012 : Renewal of the AFAQ : certifications ISO 9001, ISO/TS 16949, ISO 14001 of all Companies from NOVETUD Group. Le barème des IK réévalué…jusqu'à 4CV !